Every month should aspire to be like June! The backbone of any business is its ability to communicate in an effective way with its clients. But communication is more than talking, it also includes listening. Launch a promotion this month to foster a valuable give and take with your customers or clients. Begin with a survey on the goods and services your company provides. Offer a logoed product to those who complete the survey. Remember, promotional products represent an extremely effective tool to encourage survey participation. Get face to face with your customers without the intention of selling; allow them to tell you about their experiences with your company. Finally, tie it all together via social media – Twitter, YouTube, Facebook, etc. Produce videos that say “you talked we listened” and provide them with the steps you are taking to becoming an even better business partner. Like this idea? Call us anytime to start a delicious brainstorming session. If you missed our article about the National Pizza Party Day in May – it’s not too late! When it comes to donuts, most people have a little Homer Simpson in them. Celebrate Donut Day by visiting clients in the morning. Bring a dozen donuts in a custom box and logoed coffee mugs for all. Flat World Design can provide logoed coffee mugs and custom boxes! If your company conducts routine training sessions at client facilities or offices, or if you have an outside sales force that makes routine calls on client or customers, read on… this is a no-brainer program. The food / donut / bagel boxes shown here can be customized in four color / full color with your logo and artwork – to let everyone know who dropped off the treats! If you are one of the companies with an outside sales force, you can use these to brand your business, develop relationships and get sales. 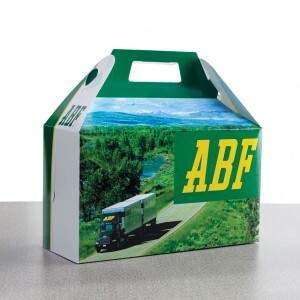 Our donut box marketing program is successfully used by large and small companies. We customize each donut box to maximize the marketing message. Every donut box includes a slot for your business card and complies with FDA requirements for food containers.